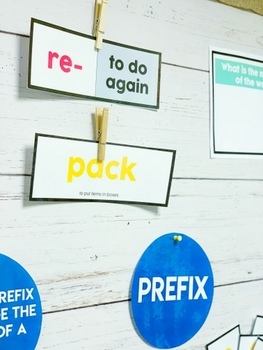 Teaching prefixes is an EVIDENCE BASED strategy to help students who struggle with vocabulary. Did you know that directly teaching word parts- affixes, base words, roots -greatly enhance vocabulary because 60% of English words have Latin or Greek origins (Armbruster & Osborn, 2001). 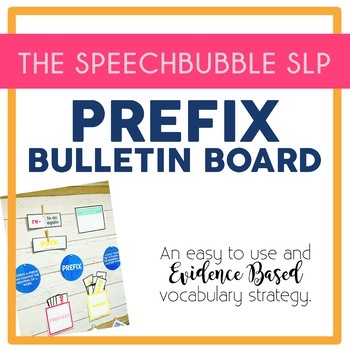 This easy to implement prefix bulletin board will allow you to provide your students with the exposure to prefixes they need without taking time away from other goals. 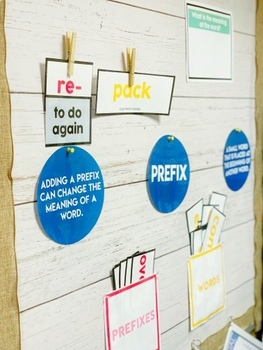 .━━━━━━━━━━━━━━━━━━━━━━━━━━━━━━━━━━━━━━━━━━━━ WHY THE 'PREFIX BULLETIN BOARD'? ✏ Research Based. This resource is supported by research regarding child language and vocabulary development. This research allowed for the creation of a resource that focuses on 8 of the most common prefixes in the English language. This allow for more frequent repetition of a smaller number of prefixes to assist in quick student learning. ✏ Easy to teach. Simply laminate, cut, and hang. Choose a new prefix each week and use the provided words to help students see how meanings can change. ✔ 30 Word Strips : 30 common words, and meanings, and provided for you to use and rotate with different prefixes for increased practice and exposure. ✔ 8 Prefix Strips: 8 strips of the most commonly used prefixes paired with their meanings. ✔ "What does it mean?' Page: Hang this page with the word and the prefix. Use a dry erase marker to write the words new meaning. ✔ Hanging Pouches: 2 sets of hanging pouches are included. Just cut, laminate and staple together to keep all of your bulletin board pieces together. ☞ This resource would best service students in grades 2nd through 5th grade. ✋Hi! I'm Maureen and it's awesome to meet you. I am an experienced and ASHA certified Speech-Language Pathologist as well as a Certified Autism Specialist. Being a speaker at the American and Hearing Association Convention, as well as at various state conventions, over the years has been truly inpiring.